Passing Judgment on Kica Bulu — How Consistently Does it Set Up? My name is Rukan Shao, and this is my first article on PokeBeach! Let me take a brief moment to introduce myself. I only started playing Pokemon TCG competitively about half a year ago. Before that, I spent most of my hobby time building mods for games like Skyrim and XCom. I eventually finished my Computer Science Masters and paid off my student loans. With newfound financial freedom, I decided to indulge my nostalgia and try playing Pokemon TCG competitively. I bought my first set of playable cards around August 2017, before competing in my first Regionals at Hartford. I placed Top 8 at Hartford with Vikavolt / Tapu Bulu-GX, and then Top 16 soon afterwards at San Jose with Zoroark-GX / Lycanroc-GX. I like to attribute this success to two things: First, to playtesting hundreds of games with a given deck. Second, to highly thorough deck analysis and optimization. This article will cover the latter. I’ll begin by covering a few rules of thumb and analyzing deck consistency. Then I will “warm up” by analyzing the consistency of Zoroark variants. 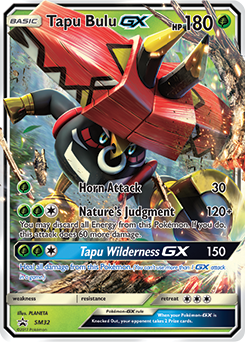 Then I’ll close up the article with a deep dive on VikaBulu, followed by passing judgment on whether the Kica Bulu variant truly is the most optimal variant. What Are Tech Cards Worth? Let’s try to develop some intuition on the value of deck’s consistency by asking a question: How does consistency affect my likelihood of making day two at a Regional? Well first, we should define consistency. For the context of this article, I define consistency as the percentage of games where a deck executes its game plan. The remaining percentage represents games where it bricks so hard you would reasonably expect it to lose. With that in mind, I want to evaluate how a 1% consistency improvement affects a deck’s odds of making day two down to some percentage: X%. I’ll cover the derivation in the section below, but I generally expect X to be greater than 1%. As in, I expect a 1% consistency increase to improve a deck’s odds of making day two at a Regional by more than 1%. The exact value of X varies from deck to deck. Inconsistent decks value each extra percentage point of consistency far more than consistent decks. While consistent decks like Zoroark possess smaller X values, the X value still remains greater than 1% in those decks. In simple terms, I’m saying that adding consistency cards to consistent decks like Zoroark is typically quite profitable, but adding consistency cards to less consistent decks like VikaBulu tends to be several times more profitable in comparison. Consistency is a percent chance. If you whiff it, you always lose. Players don’t make day two if they take more than two losses. Nine rounds in a best-of-three format. With these assumptions, I derive the chart in Figure 1.1 below. It estimates the chances a deck whiffs day two of a Regional to consistency related reasons alone. What does this chart mean, and how does one interpret it? The slope equals the X value described earlier. Around the 65% consistency, the slope is steep. This means decks with 65% consistency gain a lot of value from additional consistency. The slope decreases as consistency increases above 65%. This means each percentage point of consistency provides diminishing returns. But X value still doesn’t drop below 1 until around 80% consistency. I generally aim to reach 75-80% consistency with all my decks if at all feasible, but almost never over that. Once your deck enters the 75-80% consistency range, it’s almost always more valuable to add tech cards over more consistency cards. From personal experience, I can tell you the baseline consistency card provides roughly 5% consistency. This translates to about one less auto-loss over the course of a Regional. Please bear in mind that removing an auto-loss is different from turning an auto-loss to a win. It’s trickier to evaluate tech cards since different ones swing matchups by different amounts. Let’s start with Giratina promo as an example. Of all the Regionals data released by RK9 Labs so far, Greninja BREAK consistently represented around 5% of the field. So on average, a player expects to encounter it once in roughly 20 rounds. 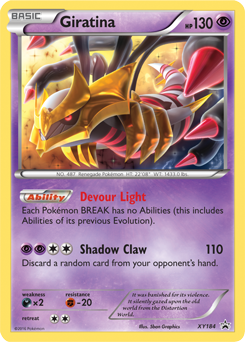 Assuming Giratina promo only flips the Greninja matchup from an auto-loss to neutral, you can value a Giratina Promo as one less auto-loss game over the course of day one. You have a 50% chance to hit a Greninja, but if you hit a Greninja, you play about two games in a single best-of-three match. Based on that, I typically consider Giratina Promo comparable in value to a “baseline consistency card”. Let’s compare that to Bunnelby for the Wailord-EX matchup in Expanded. Unlike Giratina promo, it flips the matchup to an auto-win. Thus, if I expect Wailord to make up 5% of the field, I value Bunnelby at one auto-loss turned into a win on average. That is better than a “baseline consistency card” and makes Bunnelby worthy of a deck slot for such a hypothetical Regional. How Consistent is My Deck? In the previous section I defined and estimated the value of consistency, but I did not explore how the definition can vary from deck to deck. For some decks, the answer can be pretty linear. VikaBulu decks mostly require turn two Vikavolt. Zoroark decks mostly require turn one Brigette into turn two Zoroark. For other decks, you need to consider consistency beyond turn two. Volcanion-EX needs to keep hitting Energy after Ns or to develop an Octillery, for example. For the rest of this article, I measure the consistency of a few decks using a simulator. This proves more challenging, as it’s difficult to build an algorithm or AI that simulates flawless play. The more turns I simulate, the more gameplay errors cumulatively alter the board state. So for this article, I cover Zoroark and VikaBulu exclusively. These are two decks whose turn two board states correlate well to the deck’s overall consistency and have simple turn-one and turn-two decisions. I favor simulation over doing math by hand because it forces me to consider all factors like starting with a suboptimal Basic, Prizes, not having enough cards in hand to Ultra Ball, etc. It also allows me to measure new statistics without starting over from scratch. The simulator requires a full deck list to operate. Minor details like Basic Pokemon counts can affect things like turn one Brigette odds. While the algorithm will not play as optimally as a player, turn one and turn two decisions are simple enough that it should provide a good approximation. The simulation also assumes your opponent plays N turn two on 50% of games. This assumption may affect results for Lillie-focused decks one way or another. If you'd like to continue reading PokeBeach's premium articles, consider purchasing a premium membership! It grants you full access to PokeBeach's premium articles, doubles your prize earnings in our monthly tournaments, and allows you to submit your deck lists and questions to our writers for advice! If you're not completely satisfied with your membership, you can request a full refund within 30 days! Simply cancel it in Paypal and then PM Water Pokemon Master for a full refund. No questions asked! Each subscription automatically renews at the end of its cycle, but you can stop or change it before then. 14.97 / month. You'll also get a special subscriber badge under your avatar. Averages to 13.90 / month. You'll also get a special subscriber badge under your avatar and an Advanced Member banner. Are you interested in contributing to PokeBeach's article program? If you are an accomplished player, you can apply for a writing postion here! If you prefer editing, you can also apply for an editing position here! Only article program subscribers can view this article’s comments. If you are interested in signing up, please visit the subscription page. Rukan Shao started playing competitively around September 2017. He saw some early success at Hartford and San Jose Regionals. His other hobbies include building mods for video games.